Is there clear coat on my headlights? Ever since I got my car there has been this weird texture on the top of my headlights that looks as though someone clearcoated the hood but did a sloppy job and didnt tape off the headlights. I'm not sure that it is though, what do you think it is? If it is clear coat, what can I do to get rid of it. Can I sand it with finer and finer grit and then polish it? Has anyone ever gotten paint on their headlights? Last edited by trickster; 04-23-2012 at 12:28 PM. 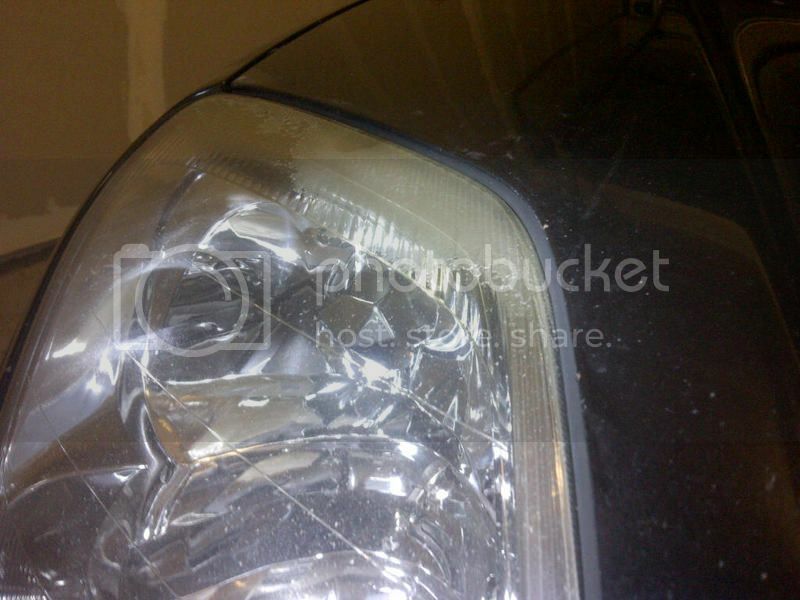 Re: Is there clear coat on my headlights? use the 3m headlight restoration kit. has different grit paper and polish. Don't be cheap! Get a good Kit the 3m is ok if your just starting to have some fading but if its really bad like what urs looks like then the Mothers Kit it worked amazing on my dad old 91 F-150. Which looked like someone painted it yellow couldn't even see at night with those things until i bought the kit and fixed his and my bumper lights. Or you can get 800, 1000, 1500, 2000 sand paper and either the mothers or maguires headlight restoration compound. Get a Buffer ball and boom you will have restored and removed the damn clear coat . Good luck! And hope that helps. the 3m kit has 3 different grit pads, rubbing compound, and protectant....... don't see how it's cheap. I've used it on lights w/ the same damage as the OP, had great results. What are the grids? The Mothers comes with 4 Different grids, Microfiber towel, Buffer Ball, Rubbing compound. Is around less than $22 if you buy it at walmart and can be used multiple times. Beside what kit did you use trickster? the info about the 3m kit can be found online, I don't know off hand. comes with a buffing pad as well. I had some clearcoat on my front turn signals, used a Turtle Wax headlight restorer kit on it, pretty much looks new now. Last edited by SethBroNasty; 05-05-2012 at 10:44 PM.